Sarasota is a city in Sarasota County on the southwestern coast of the U.S. Start off your visit on the 12th (Wed): look for gifts at Silver City Sarasota, enjoy the sand and surf at Siesta Beach, and then add some adventure to your tour with a kayaking and canoeing tour. On your second day here, enjoy the sand and surf at Bean Point, then enjoy the sand and surf at Bradenton Beach, and then admire the masterpieces at The Ringling. To see more things to do, maps, photos, and other tourist information, you can read our Sarasota trip planner. Minneapolis to Sarasota is an approximately 7-hour flight. You can also do a combination of flight and bus; or drive. You'll lose 1 hour traveling from Minneapolis to Sarasota due to the time zone difference. Traveling from Minneapolis in June, things will get somewhat warmer in Sarasota: highs are around 89°F and lows about 75°F. Finish your sightseeing early on the 13th (Thu) to allow enough time to drive to Naples. Naples is a city in Collier County, Florida, United States. Eschew the tourist crowds and head to Sanibel Causeway and South Marco Beach. You'll find plenty of places to visit near Naples: J.N. "Ding" Darling National Wildlife Refuge (in Sanibel Island) and Waterskiing & Jetskiing (in Marco Island). The adventure continues: take a tour by water with Boat Tours & Water Sports, find your balance on the water with some of the best stand-up paddleboarding in the area, and make a trip to Waterside Shops. To find other places to visit, where to stay, photos, and other tourist information, go to the Naples trip site . Drive from Sarasota to Naples in 2 hours. Alternatively, you can take a bus. In June, daytime highs in Naples are 89°F, while nighttime lows are 75°F. Finish up your sightseeing early on the 16th (Sun) so you can travel to Miramar Beach. Miramar Beach is a census-designated place (CDP) in Walton County, Florida, United States. You'll explore the less-touristy side of things at Destin Commons and Fishing Charters & Tours. The adventure continues: tour the pleasant surroundings at Henderson Beach State Park, take a leisurely stroll along Village of Baytowne Wharf, enjoy the sand and surf at Seaside Beach, and relax and rejuvenate at some of the top local wellness centers. For ratings, where to stay, traveler tips, and tourist information, you can read our Miramar Beach road trip planner. Traveling by car from Naples to Miramar Beach takes 8.5 hours. Alternatively, you can fly. Due to the time zone difference, you'll gain 1 hour traveling from Naples to Miramar Beach. 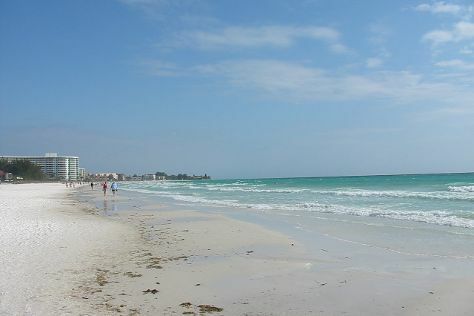 June in Miramar Beach sees daily highs of 88°F and lows of 76°F at night. Finish your sightseeing early on the 19th (Wed) to allow enough time to travel back home.